Are you planning your wedding for the end of this year or for next year in 2020? We have met with so many couples this year who have recently gotten engaged and are planning their engagement photos, and one of the main questions they ask is where do you recommend for getting married? We have written blogs on some of our favorite wedding venues in San Diego as well as Temecula but wanted to share our favorite ideas and places to get married in Southern California as a whole. Of course, there may be reasons why you may have to stay local, if you are having relatives from out of town or have a large family who already lives in the area. However, if you are able to be more flexible in your wedding planning process and are free to venture out to new places to have your wedding ceremony we have provided a few of our favorites. Idyllwild – Mountains are definitely a popular place to have your wedding at right now and Idyllwild may be one of the best locations in Southern California if you are wanting to have a small wedding in the mountains. Instead of having to travel hours to beautiful mountain ranges in the Sierra’s Idyllwild is located about an hour away from many populated cities like San Diego, Riverside and those towns in between. Joshua Tree – One of our favorite places for weddings and engagements, the desert is one of those places that makes you feel so free. If you are going for a bohemian style wedding there are so many amazing ideas you can incorporate into your wedding here in the desert. Joshua Tree is located about 30-40 minutes east of Palm Springs and surrounded by huge mountain ranges in the distance which make for an amazing backdrop for wedding photos. There are quaint Airbnb and house rentals for guests to stay at as well and you are just minutes from the national park if we wanted to head there for romantics after your ceremony. El Matador Beach – If you are considering of having your wedding in California, the beach 100% has to be an option. There are so many incredible beaches in California, but one of the most beautiful is El Matador State Beach in Malibu. 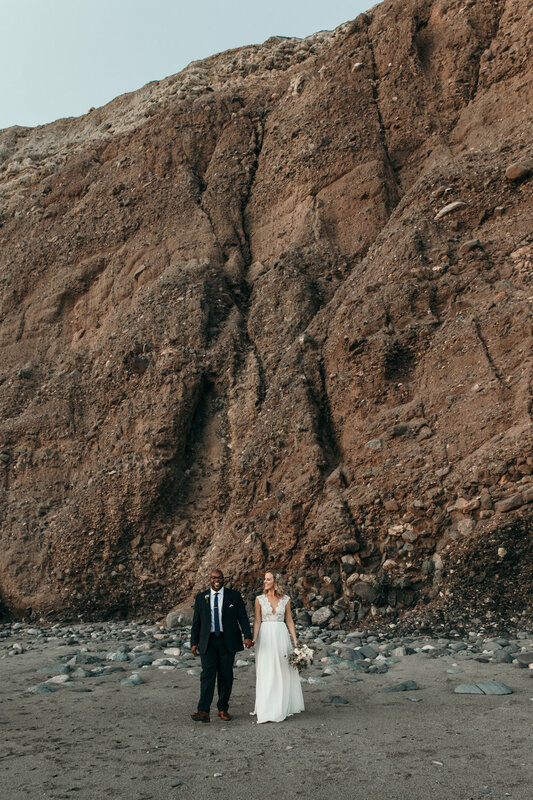 The jagged rocks that expand into the ocean and the giant caves along the coast make this one of the best wedding locations in California. If you are looking for a beach wedding photographer, we have shot here a few times and would love to head back here for your wedding! Temecula – After talking to so many brides who live in the Orange County or Los Angeles region, they are looking for a wedding venue that is located in the wineries. With Santa Barbara as an option, and the closest others being in Paso Robles which are a few hours away, Temecula is the most convenient location with over 40 wineries to choose from. Sunsets in Temecula are incredible and with the light reflecting off the vineyards, it makes for some of our favorite wedding photos. We have been a part of the Temecula wineries for years now and have tons of great recommendations for you to choose from. About us: We are destination wedding photographers based in Southern California. After traveling to many venues and capturing multiple elopements in unique locations we wanted to put together a few of our favorite locations for you to consider in Southern California. We are based in San Diego and consider ourselves San Diego wedding photographers, roaming the beaches and local surf breaks over the years has given us tons of different areas for engagement locations. From La Jolla to Oceanside we love shooting in new places along the water. We look forward to connecting with you and hearing about your love story and how you met! In the meantime, feel free to shoot us a message to hear more about locations we recommend, near or far.